That's crazy I live caddy corner from that project that Graham is apart of in Cleveland.. And this is my first time hearing of you and your channel. This is crazy now I must subscribe. Graham looks like from orange is the new black. This video reminds me: friendship is important and I have to do sky sometime. By the way, the music tho. Love the music and of course the whole video. What type of music Casey uses in his vlog? Dude. I can’t believe it. I was in Park City for work probably at the same time you were there! WHAT! Ohio City, Cleveland? Who is this dude? This video makes me miss home. I grew up in Park City. I learned to drive on those roads. I learned to ski on those slopes. I used to sell lift tickets in those windows and hang out on those sidewalks. Thank you for the beautiful shots of home. Casey!Your red coat is awesome!What make is it and where you get it? Thank you, random person who wears a PewDiePie merch, very cool. You should come in Greece! We have amazing mountains here! Didn't even know shawn was there until I saw casey in his video. I hope you collab with the spacestation soon, with your filmmaker skills & their energy, it would be epic. lol the guy at the ski lift place was wearing a pewdiepie shirt! epic! Does anyone know the names of the song played at 0:01 and 6:25? Thanks in advance. The intro reminded me of the Shining and the overlook hotel. Did you switch from FCPX to Adobe? i dare u to climb Mt.Everest. Great video. I was there as well. Wish I would have seen you. 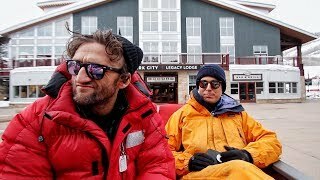 I was expecting Casey to ride some sort of Boosted-Snowboard! Go to Russia and climb the tallest mount in Europe, Mt. Elbrus. It would be really coold to see! 1:55 his a 9 year old ! Ha! The lyrics of the french song don’t mean a thing at all ! Hey Casey I'd love to guide you and Graham up Nevado del Tolima in Colombia (5250 masl) Hope you have the time, cheers from the andes. Enjoyed the 368 creatives efforts. A come from behind win for one but everyone wins at 368. @casey finally some drone shots again, i missed those soooo much!!!! Fantastic video Casey. It's ones like this that captivated me so many years ago. Music is great. BTW... Cleveland Rocks! Did not you meet Shondorus there in Utah? This was a like a flashback to the videos from 2 years ago. It was lovely to see - although i assume these sorts of videos are a little too easy for you to make to be interesting enough for you. Anyone wanna support one another? I'm inching towards 100 subscribers and trying to grow faster but it's so tough!! What is the point of subscribing to pewdiepie? why is there a piece of tape covering the brand name of the jacket Casey is wearing? i LOVE that you're repping a Oneskee!! !